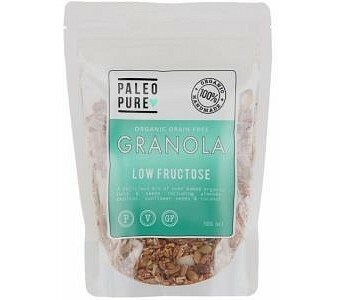 If you love a sweet, crunchy granola but need to stay away from fructose, try this delicious no-fruit, low-fructose offering from Paleo Pure. They make it by hand, mixing nuts, seeds and coconut with fructose-free brown rice syrup and cinnamon to get the perfect flavour profile before baking it in the oven to bring out the crunch. This mildly sweet granola is delicious on yoghurt, with fresh berries, or all by itself. Ingredients: Almonds, Brazil Nuts, Pepitas, Sunflower Seeds, Shredded Coconut, Coconut Flakes, Coconut Oil, Brown Rice Syrup, Ground Cinnamon.